1 Peter 2:21-24 – For to this you have been called, because Christ also suffered for you, leaving you an example, so that you might follow in his steps. 22 He committed no sin, neither was deceit found in his mouth. 23 When he was reviled, he did not revile in return; when he suffered, he did not threaten, but continued entrusting himself to him who judges justly. 24 He himself bore our sins in his body on the tree, that we might die to sin and live to righteousness. By his wounds you have been healed. 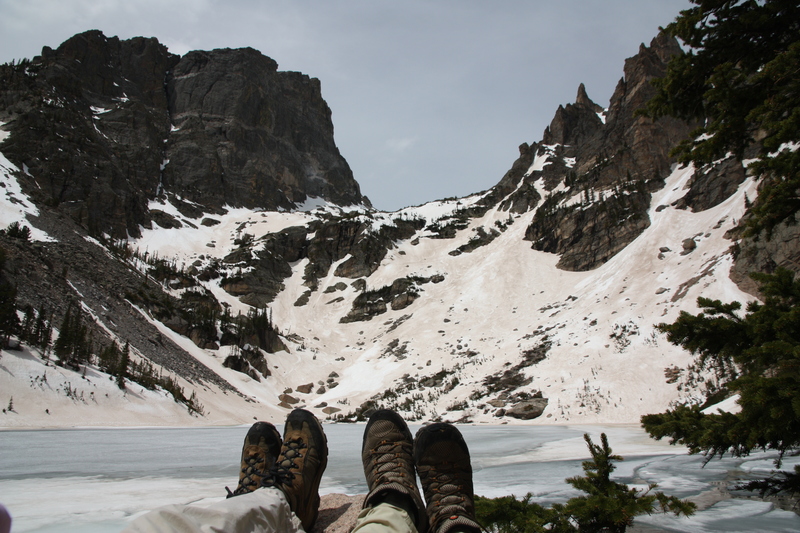 Taking a break and enjoying the view after hiking the snow covered trail up to Emerald Lake. Rocky Mountain National Park, Colorado. If you have ever hiked on snow, you know that it is easier to follow in the footsteps of someone who has gone ahead of you, rather than blazing the trail yourself. But, just because someone has traveled the path before you, does not mean the hike will be easy, you still need to do the work in order to get to the end of the journey and enjoy the scenic view. The Christian walk is not always an easy one, especially when you consider in whose steps we follow. But the rewards at the end of the journey will far exceed even the most scenic and spectacular views we find at the end of the trails we travel in this life. This entry was posted in God is Revealed... and tagged 1 Peter, 1 Peter 2, Bear Lake, Christ, Colorado, Emerald Lake, First Epistle of Peter, God, Gospel of Luke, Hiking, Jesus, Luke 9, Rocky Mountain National Park, Snow, Trail by Todd D. Nystrom. Bookmark the permalink.